Grooming your dog often helps your dog to be healthy. While the requirement to clean it’s ears depends on the breed and size of the dog. But there are some dogs which are prone to catch ear infections every now and then if not cleaned properly. Cleaning dog ears often will help in their overall health. The build or the physical structure of the dog’s ear is seldom easy to clean. They tend to trap the dirt deep inside the flat canal which leads to the eardrum. This material without any cleaning will block the ear and will cause itch and cause pain or even infections to your dog. So the cleaning of dog ears plays an important role in its health. The good news is that cleaning a dog’s ears doesn’t demand any special equipment. A normal cleaning solution and some cotton balls can do the magic task. Don’t forget to reward your dog with some treat after the cleaning session. Kindly refrain from using cotton buds as it might push the dirt deep inside the ear canal and will cause immense pain to your dog. Not every breed of dog needs ear cleaning. Though it an important responsibility to take care of your dog’s health, overdoing of cleaning will land your dog into unnecessary pain. Some of the dogs don’t need ear cleaning at all while some of the breeds do. It is advised to clean your dog’s ear when there is a bad odour or discharge from the ear. Inspecting for any red rashes or the dog is irritated by the ear. These are a sign of a need for cleaning. A suggestion can be to go a veterinarian prior to cleaning dog ears. 1-Sit in a comfortable place where doggy can sit in front of you with its back directing towards your and front part facing your legs. If your dog is big, place him to sit in one corner of the room facing towards the corner. 2-Then get closer to ears and hold the ear flap right up so that you can see what is inside the dog’s ear. By lifting the ear up you can provide yourself some vision of what is inside the ear canal. 4-Squeeze the solution in the dog’s ear: Make sure that you fill the ear canal with the solution. Notice that the tip of the bottom should not touch the ear of your dog; if this happens ensure that the bottle mouth is cleaned completely. 5-Hold the ear flap still and with other hand starts to massage the ear opening for half a minute so that the dirt will dissolve into the solution and breaks into small debris. Listen for the solution moving while you are massaging the ear. 6-Hold the ear still and wipe away the debris and dust with the help of a cotton ball or gauze. 7-Leave the dog to shake the head, this will make sure that there will not be any solution or debris still hanging in the ear canal. Shaking of the head will ease out any loose debris too. 8-Again clean the dirt off with the help of cotton ball, wash out the loosened debris from the opening of the ear canal. 9-Clean any dust and debris remaining in the visible region: Clean only till a finger deep level as we can’t see further inside. 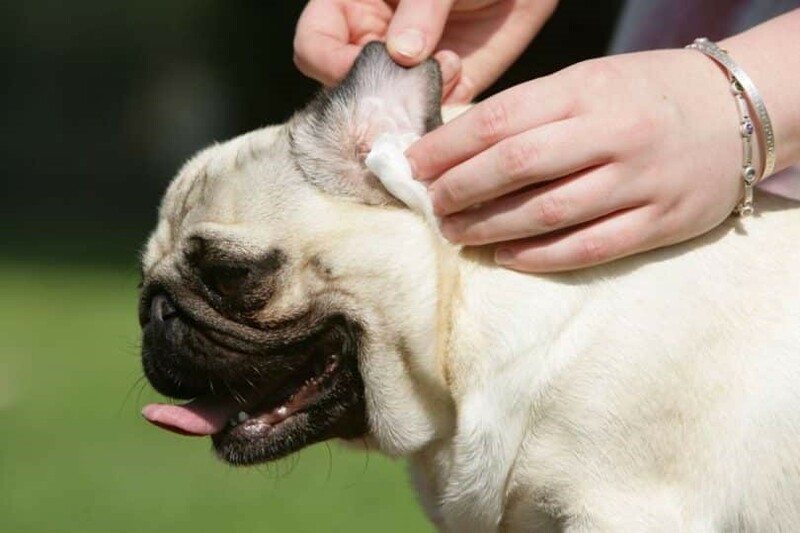 10-Clean the ears with dry tissue: Wait for the dog to get used to it’s clean ears. 11-Never use any sharp objects while cleaning dog ears as slight movement by your dog results in hurting in their ear. Don’t even use cotton bud to clean the solution from the dogs ear. 12-Provide a treat to your happy dog. 13-Do the same with the other ear. 14-If the dog shows any sign of pain in the middle of process ,stop cleaning it’s dog ears and consult a veterinarians for professional guidance. 15- Repeat the same cleaning process for every 2-4 months or as prescribed by the veterinarian. Dogs are some of the sensitive animals; care must be taken while you are having them. If your dog has an ear problem kindly take him to the nearest vet for the required medication. Take suggestions from the vet about cleaning dog ears.